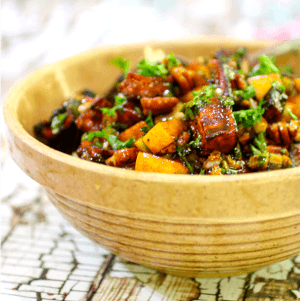 This easy, roasted sweet potato salad is packed with flavor from fragrant spices, tangy-sweet balsamic vinegar, sultry vanilla, and just enough smoky, hot chipotle to make it tingle. Perfect for summer potlucks, it’s also a healthy side dish for the colder months, and a nice change from regular, creamy potato salad anytime. This recipe is updated from the original 2009 version. I grew up eating potato salad, and to be perfectly honest I love it all — creamy old fashioned potato salad, hot German potato salad, and every single variation in between. By Labor Day I’m pretty much potato-saladed-out and it’s a mad dash through my cookbooks to figure out what to serve at the Labor Day bash. One year I happened to have some heirloom sweet potatoes on hand from a trip to farmer’s market and I had a wild and crazy idea. What if I did a potato salad mash-up (mash-up, get it?) and took all of the best parts from ALL the potato salads I liked. It was awful – at least the first try. The second wasn’t much better but by Labor Day I had created this – and it was SO good that the bowl was emptied minutes after it was put on the table. This recipe is easy enough for a beginning cook. You’ll find chipotle in adobo in cans – usually in the Mexican food section – or Amazon. Amazon has everything! Sweet potatoes and yams are nutritional powerhouses! They have plenty of fiber, vitamin A, vitamin C, magnesium, B6, vitamin E, vitamin K, calcium, and iron. Can you use yams in place of sweet potatoes? Yams and sweet potatoes can be used interchangeably. A yam is a starchy edible root that’s related to lilies, and is imported to America from the Caribbean. It’s drier and starchier than a sweet potato – think of the difference between bananas and plantains. Sweet potatoes are members of the morning glory family. Depending on the variety, sweet potato flesh can vary from white to orange or even purple. The orange-fleshed variety is the most well known and, in order to distinguish it from the more well known white variety , producers chose the English form of the African word “nyami” and labeled them “yams.” Sweet potatoes are softer and sweeter than true yams. The U.S. Department of Agriculture requires that producers put labels that have the term ‘yam’ to be accompanied by the term ‘sweet potato.’ Despite the label regulations, most people still think of sweet potatoes as yams regardless of their true identity. 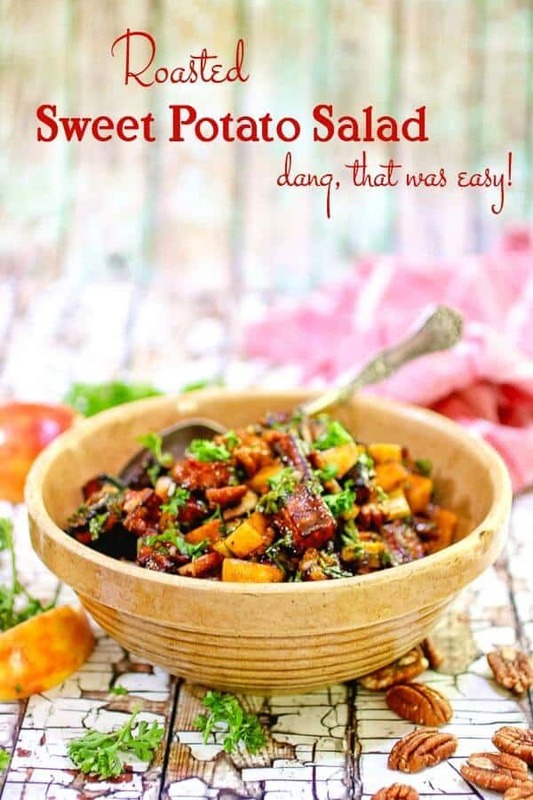 How do you make sweet potato salad? Mix up the ingredients for the vinaigrette and let stand for at least an hour to blend flavors. Toast pecans in the oven at 350F for 5 minutes – watch carefully and stir often! Mix the ingredients up in a large bowl with the cooled, roasted sweet potatoes, and stir in the vinaigrette. Serve immediately or chill in the refrigerator to infuse more flavor into the potatoes. 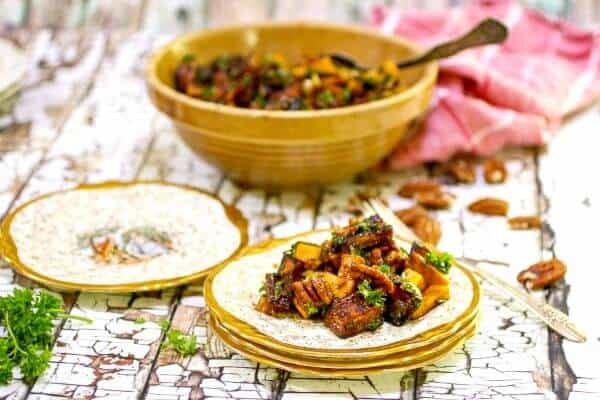 Beware though – with the chipotle as it stands it will get spicier – you may want to wait to add the chipotle until just before serving. Sweet potatoes and yams can be used interchangeably. How do you cook sweet potatoes for a salad? I prefer roasting them but you can boil them or even cook them in a microwave. If you’ve got the grill going then you can slice them thickly, brush with oil, and grill them. Toss with seasonings and a little olive oil. Place on an oiled, heavy baking sheet. Roast at 425F, stirring often, for about 30 minutes. Can you eat cold sweet potato? Yes! They are so good just about any way you want to make them. As long as it was scrubbed well before baking there’s no reason not to! It adds extra nutrition and fiber. You can use cider vinegar if you absolutely have to but it’s really really not as good. Roast the apples and onions, too. Add some fire roasted poblano peppers. 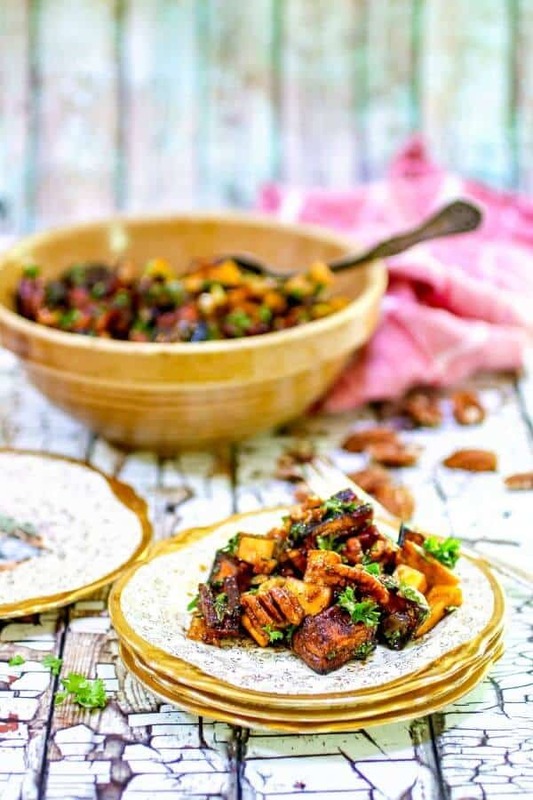 Roasted sweet potato salad has smoky chipotle in it to give it that pop of southwestern flavor! Hamburgers – this surprised me but I really like this salad with burgers! A good balsamic vinegar is thick, sweet and tangy. It’s great in this recipe BUT this vanilla balsamic (or a vanilla fig flavored one) REALLY kicks up the flavor! Here are some more side dish recipes you might like. This is truly a unique side dish with plenty of flavor. It’s easy to put together, too. If you have leftovers (ha!not likely) keep them in a tightly covered glass or plastic dish in the fridge for up to 4 days. After that it gets kind of soggy. 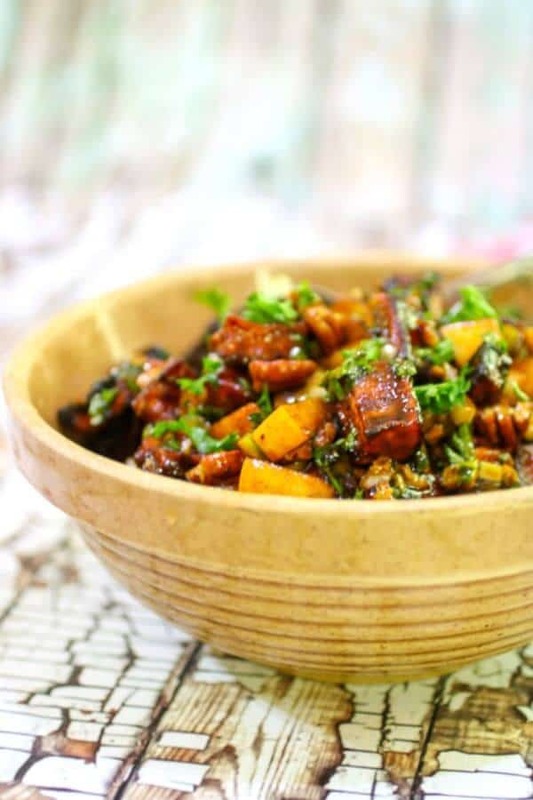 If you’re looking for a less sweet, more savory recipe try this sweet potato salad from Averie Cooks. If you love this recipe please give it 5 stars! Thanks! Sweet and spicy flavors make this unique side dish a family favorite. Included in Meal Plan Monday.